This is ‘Quantum Composition’, converted into a VR artwork by Nao Sawa, a sculptor artist. This work was created from 3D-scanned data. In this space, you can experience new expressions by VR-specific ways such as walking in the air, floating the objects. Is this a work that established a new way to break the boundary between analogue and digital by making good use of VR? In this interview, I asked about the design process of ‘Quantum Composition’, giving some ideas about her spirit and expression. Nao Sawa. She was born in Tokyo. She spent her teens days in Brazil. Sculptor artist. She was originally on ceramic sculpture, but now also creates artworks made of urethane foams or fabric as less fragile options. 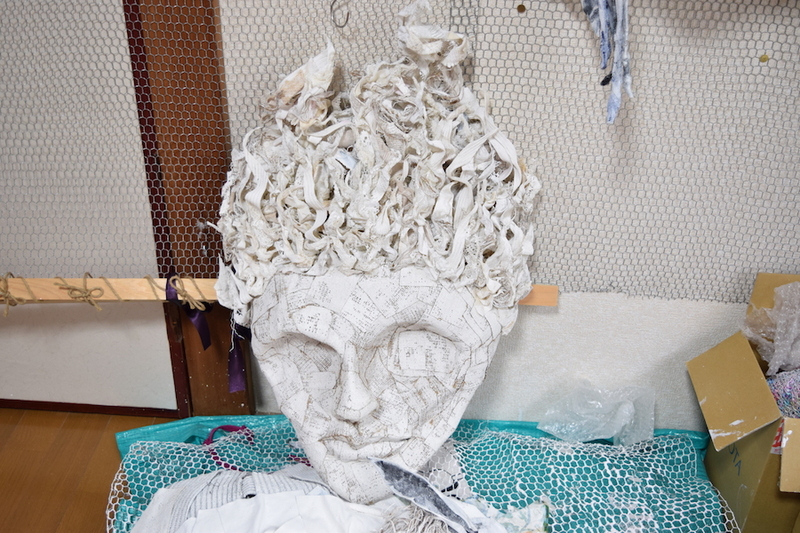 In her activity, the main theme of her works is how to face the view of death and life based on her own experience. 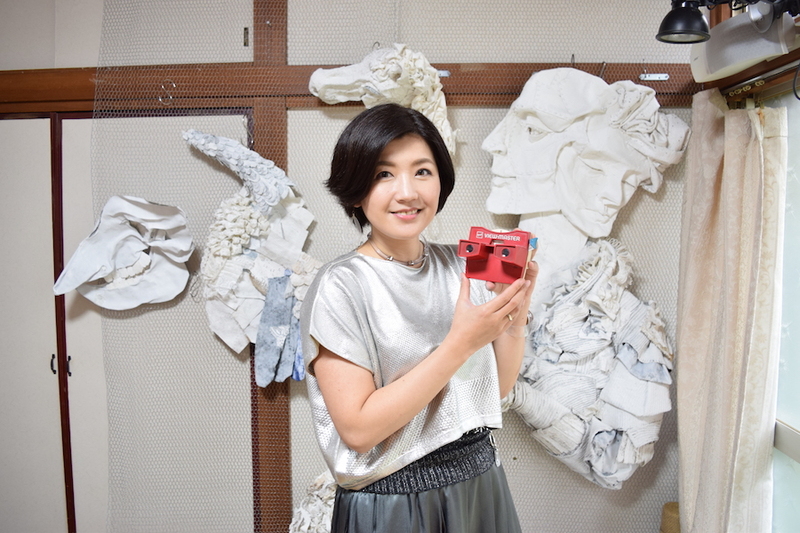 She also started creative activities on VR from 2017. — What does the title ‘Quantum Composition’ mean? Sawa: I intended it to mean that all humans and world consists of particles. I expressed a Zen-inspired space with minimum materials. But, I honestly hope viewer would understand it in their own way. I am personally interested in Japanese ‘metaphor’ culture. So, instead of expressing a clear message in VR art, I want people to think of it by themselves. It is OK to be considered as boring one if they really think it is boring and I am also happy if they found it just relaxing. — How did you express the meaning of ‘Quantum Composition’? Sawa: I expressed what ‘VR’ can do. I believe that people are the happiest if they are free from everything, which is so-called ‘healing’. In VR, you can fly up and down without gravity as if you were in space. While I couldn’t feel so immersive by being surrounded by real-world sculptures, I am deeply impressed by how immersive they are in VR. After all, what I want to express through my art are healing and liberation. Leaving ‘surprising’ work to other artists, I want to adopt an ‘analogue’ approach. Even without higher skills, I could do it with tricks and ideas. — How was the design process of the work? Materials used in this work. 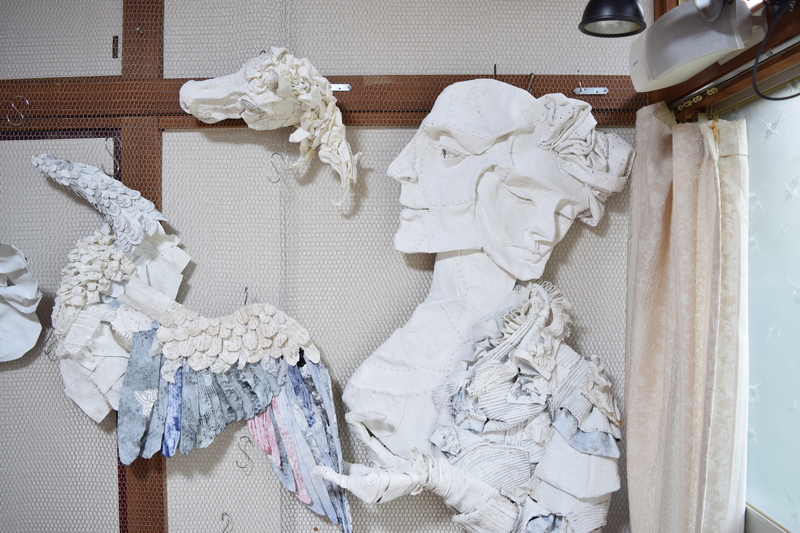 Sawa: I copied and placed the 3D-scanned data of the original work. The materials scanned for this work were pieces of fabric such as my used sweater. Although I was making it out of clay earlier, it did crack and, anyway, was too heavy. As some of the sculptors in the work are more than 1m in overall length, it’s hard to carry when going abroad. So I happened to have an idea of making it out of fabric and had a good feeling to try that way. The sequence is as follows. Firstly, paint the fabric over. Then, cutting and pasting it, form the shape by Glue Gun. In my opinion, just reproducing what it was in real world is pointless so I expressed three-dimensionality and shapes by shade so that the appearance is changed when the viewer looked the work from a different angle. —Where did you focus on when you picked up 3D-scanned materials? 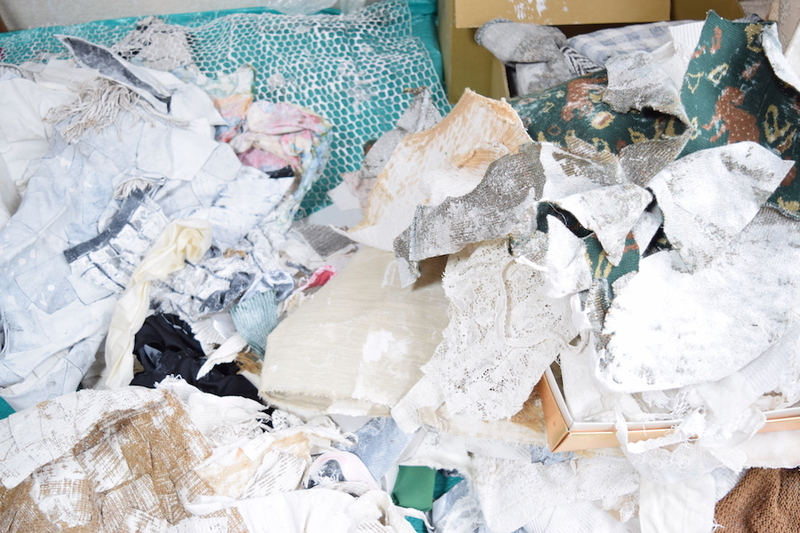 Sawa: It’s the colour, white. I think white is a perfect colour. White expresses purity, innocence, zero and infinity, indeed. That’s why I value this colour. I wanted to express ‘skin’ by covering with white colour. I think people suppress their various emotion and reason, whether for good or for bad. I use white to mean that people have a peace of mind over those mixed states. There are a lot of creators to provide the works with reality. And, it’s the very reason why I wanted to create the space that didn’t have anything to surprise. So I just multiply an object with various scales and place them. — How long did it take to complete this work? Sawa: About a week. 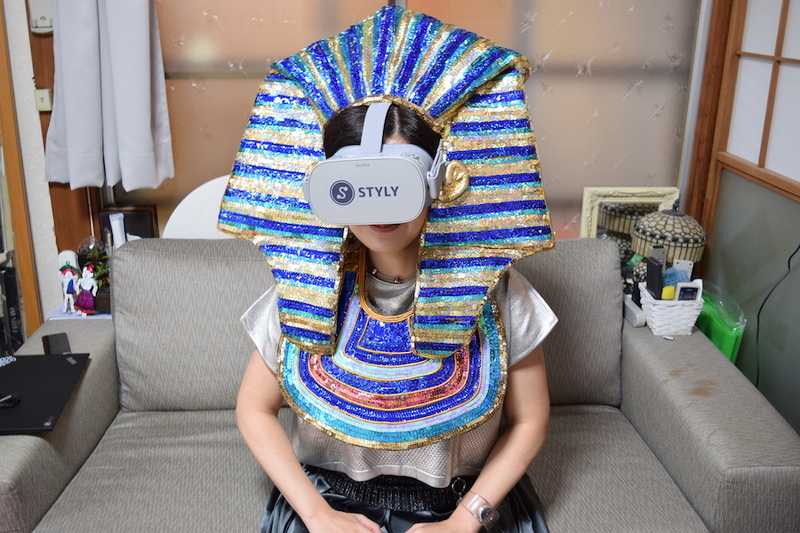 Although it’s the first time to use VR, STYLY is easy to understand thanks to its ‘Layer’ concept, in my impression. At that time, I didn’t know how I should face the VR creation, but my relation with VR started when I ‘bravely’ asked to scan the materials in 3D. —VR sounds difficult in general. What is your opinion on it? Sawa: I certainly doubted that an ‘analogue’ person like me could use VR, but I felt happy right away when I just viewed the images in my actual VR experience. 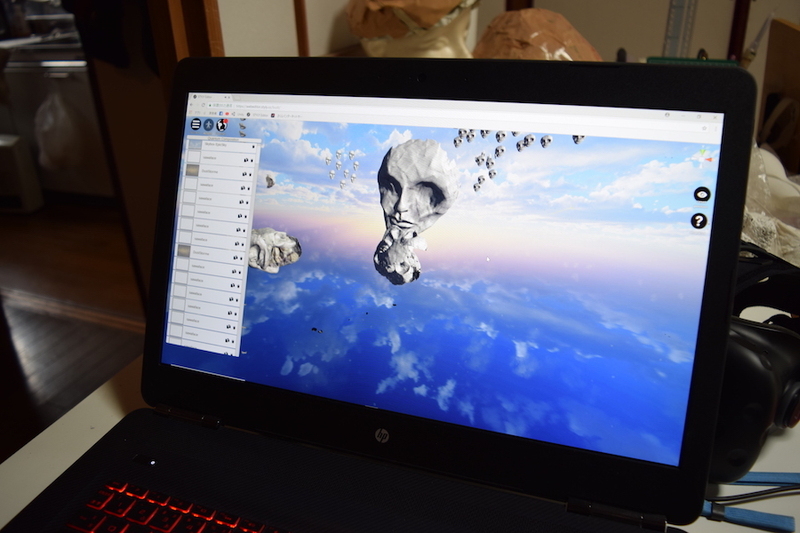 Since then, I could face the creation in VR without difficulty. As I cannot finish up the details just by digital approaches, I was honestly surprised when Psychic VR Lab asked me to be a bridge person for creators. Then, I thought it’s important how an ‘analogue’ person could be involved in the latest technologies. — Have you been interested in VR before? I talk about my original VR experience with VIEW Master, an American product available since 40 years ago approximately. With VIEW Master, you can make a picture-story progress by pressing the shutter release button on the side of it. Even with the technology available at that time, it well surprised me by the quality of presence and three-dimensionality. And, there was ‘2D x Reality’ concept already, which means that it had the same concept as the present VR has. So I was deeply impressed by its technology. I wanted to escape from reality since I was small. I hoped I would dive into my ‘mobile’ sanctuary by VIEW Master or reading books. — What’s your plan to make use of VR technology? Sawa: Thinking about what super ‘analogue’ people can do, I recently started ‘VR walk-around diary‘. It just has movies taken by Theta or GoPro FUSION while walking around the town, but I feel as if I were leaving my body or experiencing someone’s life. In addition, I record videos of university facilities and laboratories. Such ‘Analogue’ contents, just taking videos, would be something that the people with strong ‘digital’ skill have never thought, I think. As well as the person who knows about fashion can create fashionable things, I would be able to create the contents to appeal to VR beginners, which is something the technical person doesn’t think of. And, VR is now more reachable thanks to the release of Oculas Go. I understand my role to explain and give a lead for my friends and people who want to start VR activities. 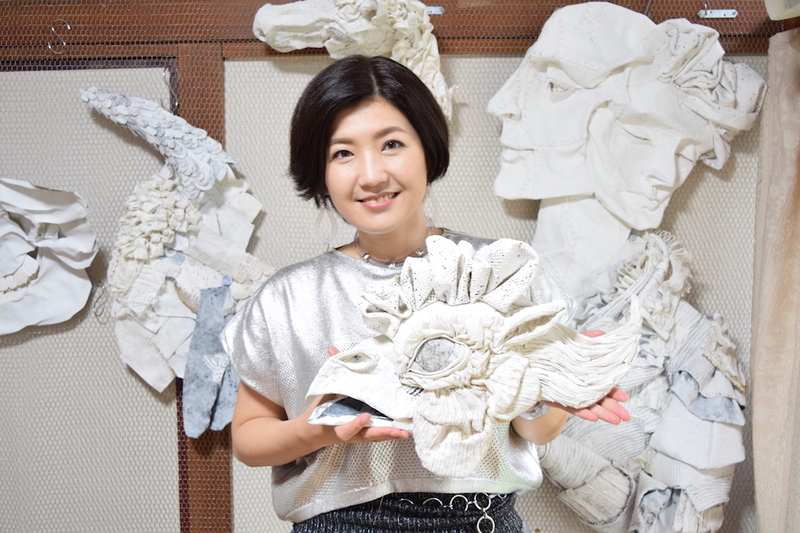 Ms. Sawa keeps doing her creative works to get along with her traumatic experience. And, ‘Quantum Composition’ has been created as her new expression approach. Ms. Sawa bridged VR and ‘analogue’ creators together by this work. I expect her to develop her expression method further.